Here's one of the latest sketches created in series which I'm setting aside for a joint exhibition 16 April to 5 May 2015 at 'The Inspired gallery' on the North Yorkshire Moors right at the top of Sutton Bank. I'll be showing my work with 3 other talented artists who so happen to be 3 of my students who are semi professional artists in their own right. It's an honour to be showing with them in this, our first touring exhibition 'All Paintings Great and Small' to be held at other venues in Yorkshire several months apart throughout the year. The focus of the exhibitions is slightly different each time but the main content will have a wildlife theme. 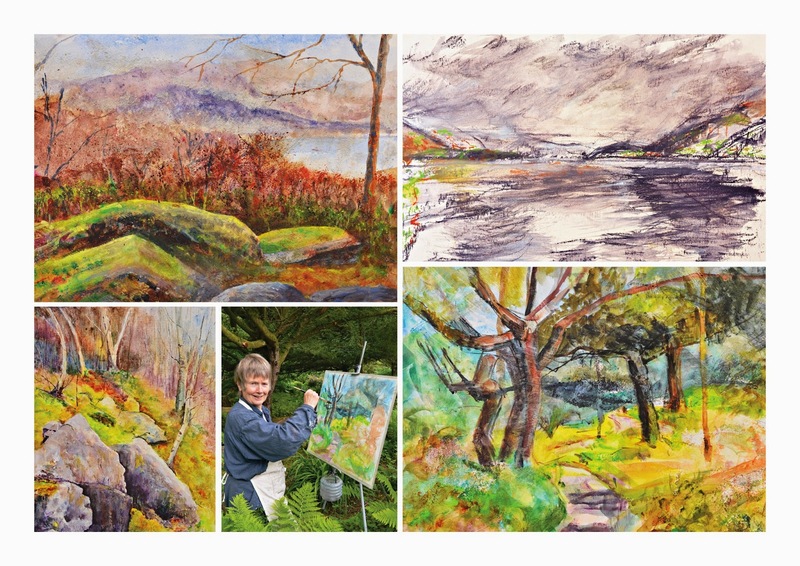 as the North Yorkshire Moors national park covers so many of the areas we all find inspiration from this will be a really exciting exhibition. This sketch is one I created from an area I've visited several times and I just love this view. It is a little way out of Runswick Bay (on the east Coast of Yorkshire) and the view is seen at the end of a long road that stops at the top of the cliff edge. The track connects the farm shown on the left to the rest of the world it would seam. The isolation here, peace and tranquility is just great! I've created this view in pastels but never in paint. Watch this space! The sketch was created on Hahnemühle Britannia 300g/m2 140 lbs matt 30 x 40 cm 11.8 x 15.7 inch block pad. As a black and white water media work on this paper tonal contrast remains bright, sharp with clean edges and the robust quality of the paper surface even allows good scraffito (scratching) techniques to be applied with the point of a scalpel and the edge of a razor blade without plucking. 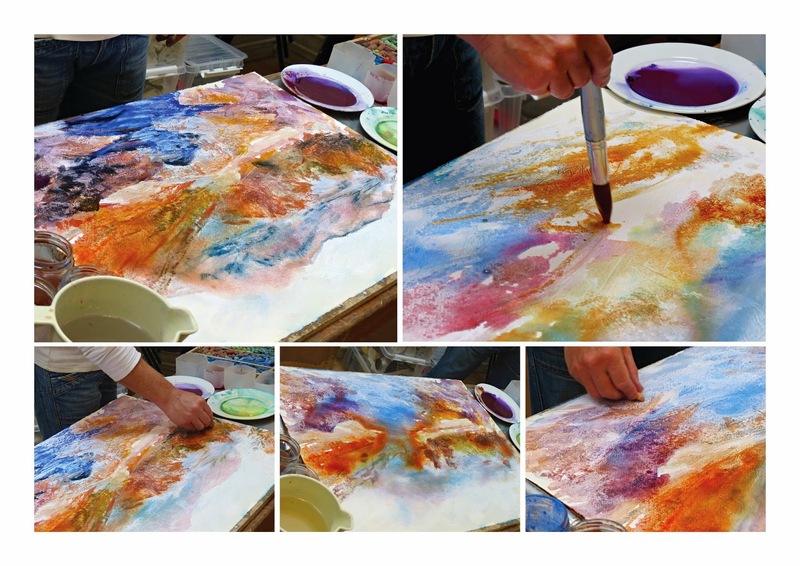 A great paper to work on which inspires confidence for expression when painting. Being a regular contributor 'The Artist' magazine I have been invited to road test several new papers made by 4 mills. Hahnemühle's new papers therefore forms the first of 4 articles focusing on each mills different papers - all with very different results. Here are Hahnemühle's contact details to explore their great ranges of papers still further. 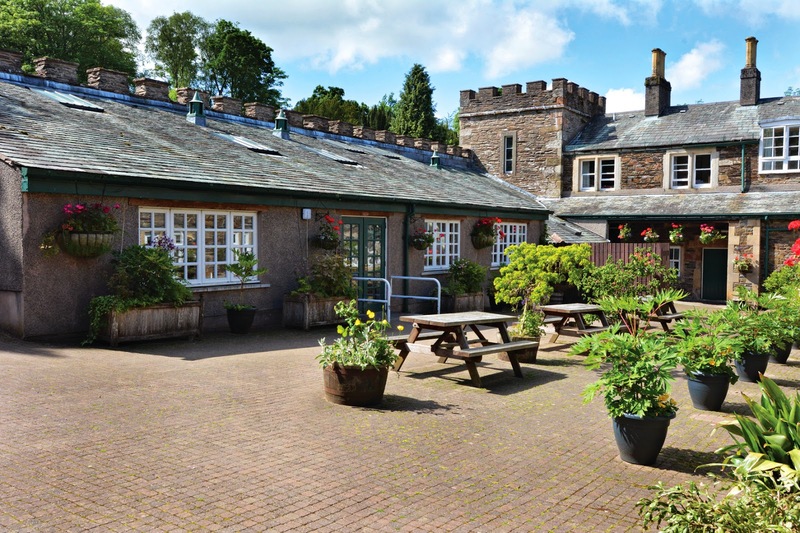 Success for all at Higham Hall! 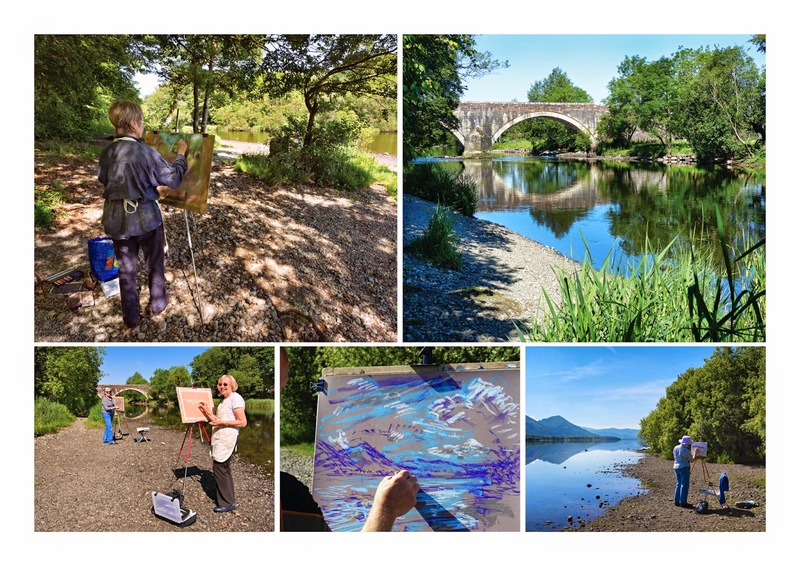 Elspeth explores an abstract approach along the lakeshore of Bassenthwaite Lake looking at the flanks of Skiddaw Fell - fantastic big brush strokes! 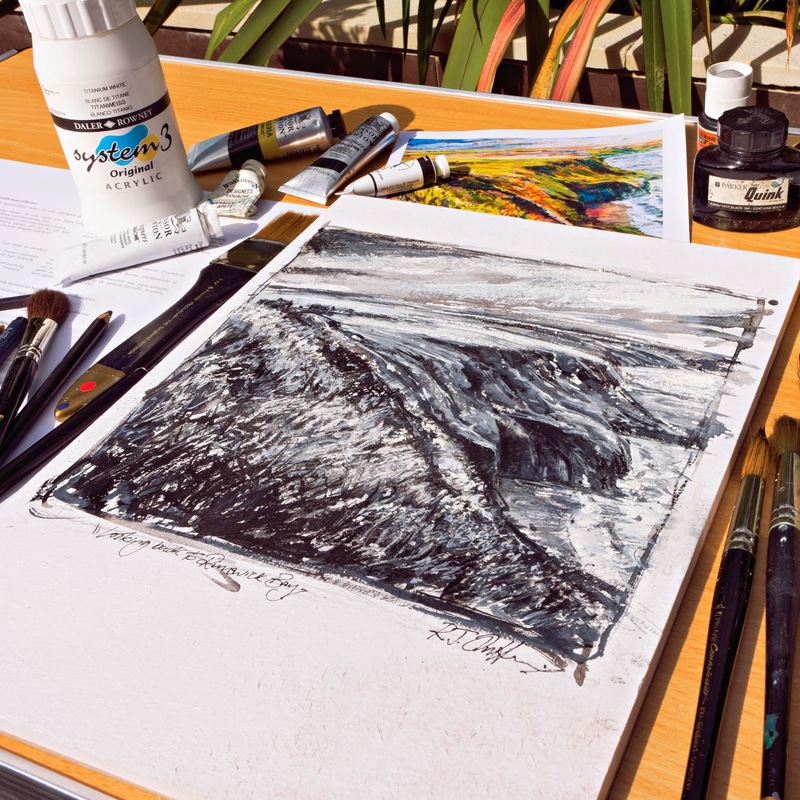 Just returning from another recent and successful residential art break in the Lake District it is great to reflect just how rewarding and enriching the creative residential art breaks are for everyone who attends - art students and tutor alike! 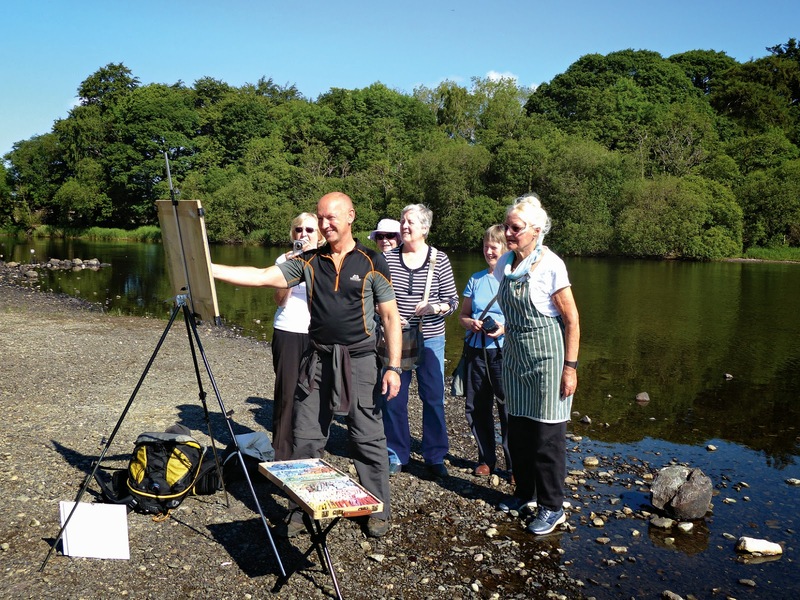 Teaching at Higham Hall in the Western Lakes recently on a successful residential 4 day art break (3 - 6 June'14) was a great way to help encourage all who attended lots of different creative techniques enjoying our painting in the heart of Lakeland. 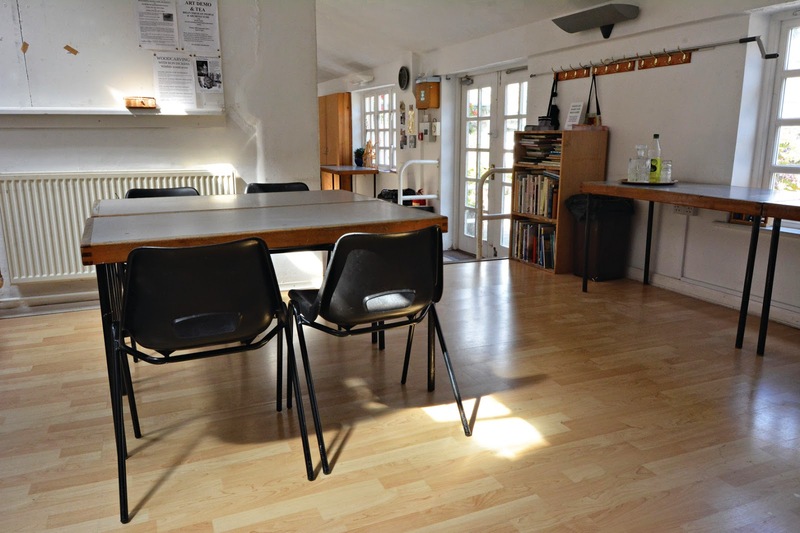 The bright and well equipped studio at Higham Hall awaits! the perfect place for relaxing between brushstrokes! Higham Hall is unique. 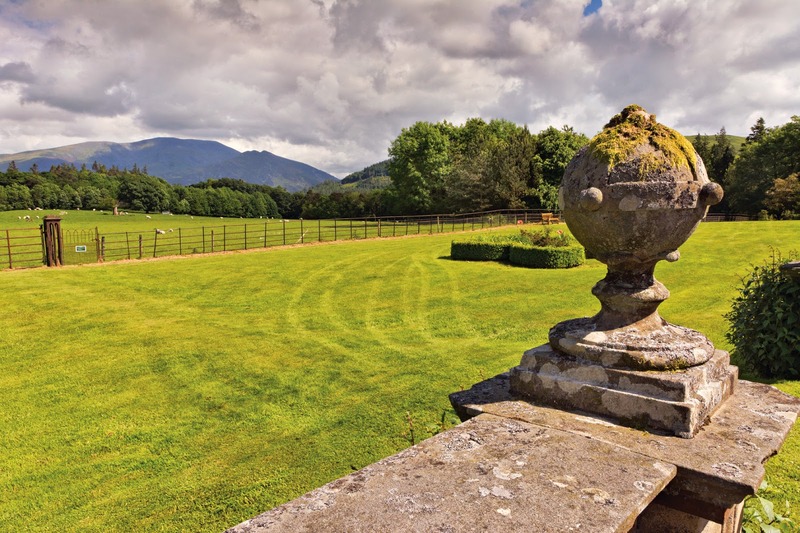 There are not many independent residential colleges within the UK that can boast to have an impressive historic building offering a high class ‘country retreat feel’ set within their own stunning gardens, amidst the majestic Lakeland fells. 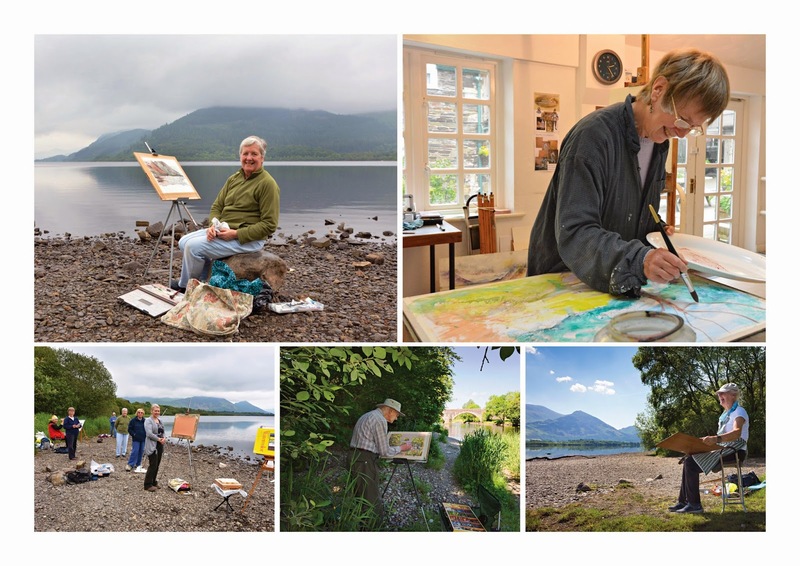 On several different days we visited different lakeshore locations around Bassenthwaite lake to paint - really rewarding for all which sharpened everyones perceptions and advanced their painting skills in so many ways. 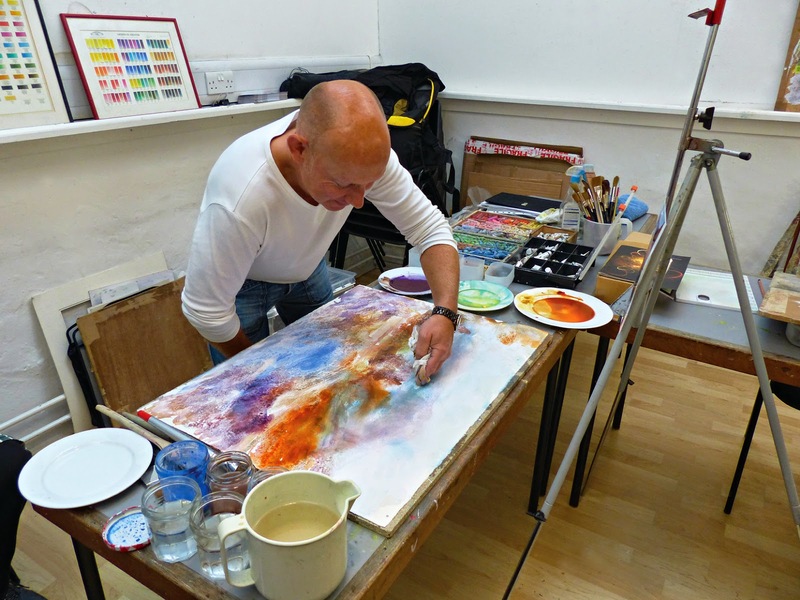 The bright and airy studio is fantastic for painting too and everyone just loves the creative atmosphere in this wonderful space. We created lots of different mixed media paintings based on our outdoor experiences and packed so much into the four day break with fantastic results created by everyone. 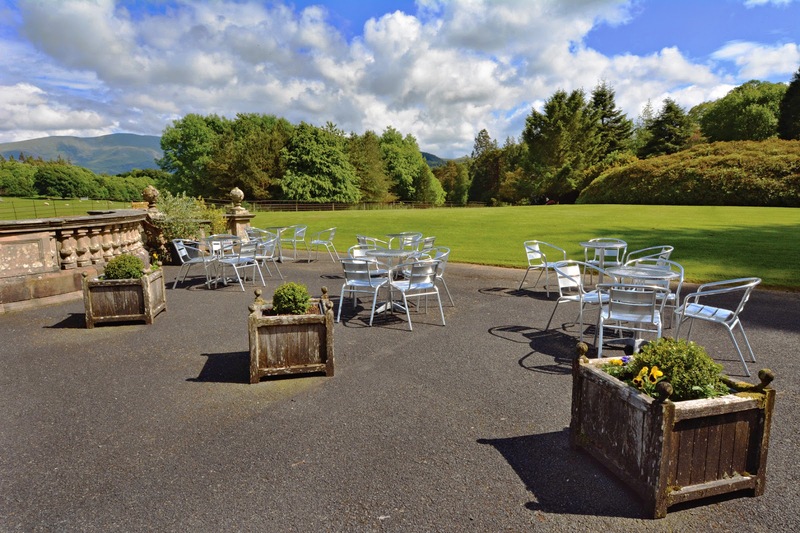 another perfect chill out zone with inspirational views! 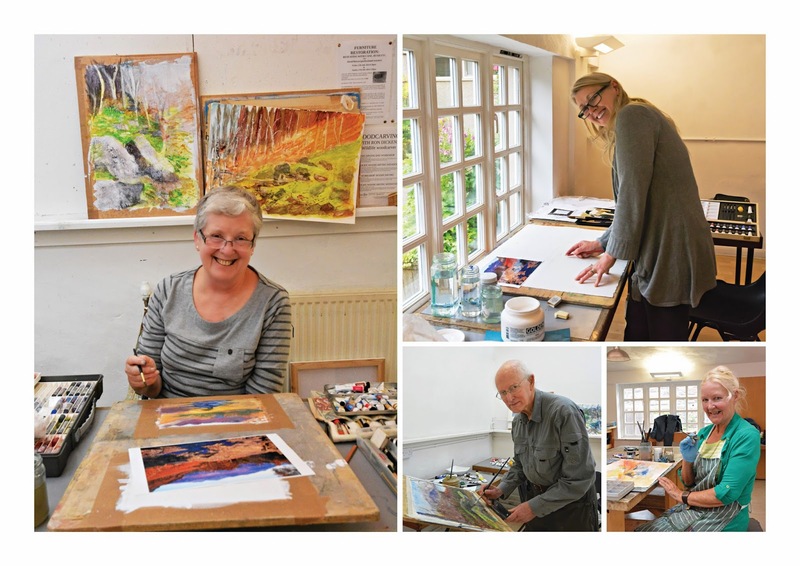 Demonstrating for the group mixed media painting techniques with watercolour and pastel at Higham Hall - a fantastic creative experience for all! The demonstration in action! Big brushes, big paper and lots of run and pour techniques! Now you all have a go! Great results too! Just a small selection from the great work everyone created - superb! Elspeth chose to work in the fab gardens at Higham Hall - a great result too! The next course I’ll be teaching at Higham Hall offers different workshop days back to back with evening demonstrations using different media. 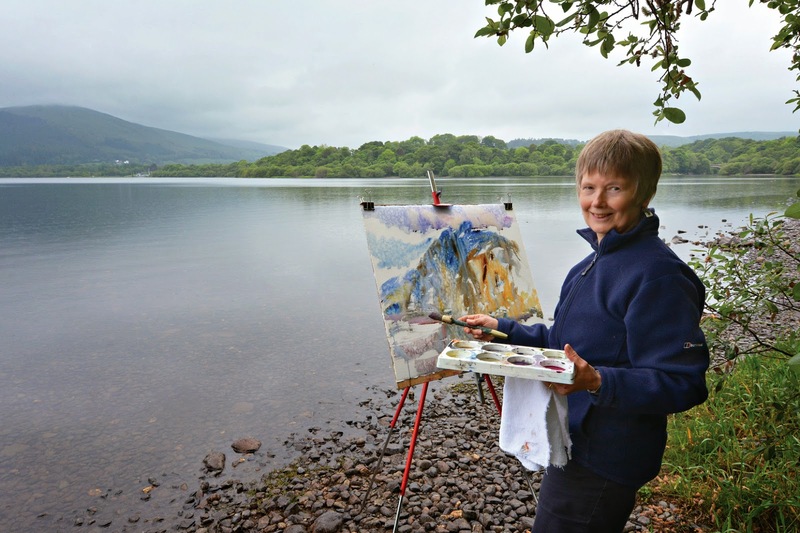 A great opportunity for those who come to gain for themselves new and exciting painting experiences with me, in a remarkable Lakeland filled with Autumn colour. Now that’s something we can all look forward too!